in your will, trust, retirement plan or life insurance policy. Join our Hillel Heroes Legacy Society. Learn more by contacting Rabbi Dov Oliver at doliver@sunyrockland.edu or 845-574-4422. 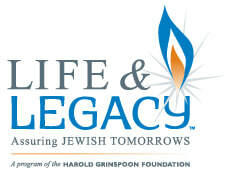 LIFE & LEGACY™ is a signature program of the Harold Grinspoon Foundation. Since it began just a few years ago, LIFE & LEGACY™ has helped hundreds of Jewish institutions in North America realize a long-held dream: to make a Jewish future a reality at their synagogue, temple or Jewish agency. In Rockland County, LIFE & LEGACY™ is a shared endeavor of 13 Rockland Jewish institutions. It includes Jewish Federation & Foundation of Rockland County and is managed by the Federation. Anyone can leave a legacy gift to the Jewish organizations that have been so dear to them throughout their lives. It demonstrates a commitment to Jewish tomorrows, to the Jewish values instilled in us by our parents and grandparents, and the preservation of programs and organizations that support Jewish life in Rockland County.